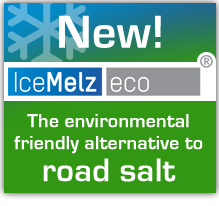 IceMelz eco is leading in the field of sustainable de-icers. We are proud of our position in the market and we focus our scientific capabilities to meet customer demands for ecological de-icers that contribute to a better working and living environment. We see it as our charter to meet and surpass your expectations, our customers -and those of your customers-, every day and every where. Our innovative sustainable solutions are being applied internationally en secure the highest quality. Our superior offer covers total-solutions for all professional applications including training, logistics and administrative support using our products. IceMelz eco is internationally active and can offer attractive solutions to national and international customers. We have a network of certified dealers which are periodically trained by our specialists on the latest innovative product developments. IceMelz eco gives the world a better living and working environment! !